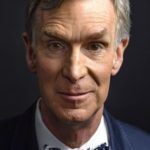 William Nye popularly known as Bill Nye the Science Guy, is an American science communicator, television presenter, and mechanical engineer. He is best known as the host of the PBS children’s science show Bill Nye the Science Guy (1993–1998), the Netflix show Bill Nye Saves the World (2017–present), and for his many subsequent appearances in popular media as a science educator. Nye began his career as a mechanical engineer for Boeing Corporation in Seattle, where he invented a hydraulic resonance suppressor tube used on 747 airplanes. "Climate change is happening, humans are causing it, and I think this is perhaps the most serious environmental issue facing us." "Humor is everywhere, in that there’s irony in just about anything a human does." "When we see the shadow on our images, are we seeing the time 11 minutes ago on Mars? Or are we seeing the time on Mars as observed from Earth now? It’s like time travel problems in science fiction. When is now; when was then?"